Socrates Taught Plato, Who Taught Aristotle, Who Taught Alexander the Great - Fact or Myth? Socrates taught Plato, who taught Aristotle, who taught Alexander the Great. In other words, the famous Greek philosophers and the famous Greek philosopher-king (of sorts) all had a student-teacher relationship. Socrates is mostly known through the accounts of classical Greek writers, but Plato describes him as his teacher. Plato’s Academy (AKA the Academy) was founded by Plato in circa 387 BC in Athens. At seventeen or eighteen years of age, Aristotle joined Plato’s Academy in Athens and remained there until the age of thirty-seven (c. 347 BC). Aristotle left Athens and, at the request of Philip of Macedon, tutored Alexander the Great beginning in c. 343 BC. NOTE: The image (an engraving by an artist named Granger) used in the header shows Aristotle passing along the knowledge of philosophy to a young and uninterested Alexander the Great. The term arete was added to the image by me the author. It is meant to imply that Aristotle is helping Alexander achieve his “highest good” (his own highest good and later the highest good of the state) by opening his mind to “the love of wisdom” (philosophy). He is in Plato’s terms, guiding him through the cave. Further, it implies that the transference of knowledge from Socrates’s predecessors to you today is part of the same story. Learn more about arete. Plato and Aristotle (Introduction to Greek Philosophy). After his tutelage, Alexander then went on to conquer the east (for better or worse at the time). Along the way, he founded a series of new cities, all called Alexandria, including modern Kandahar in Afghanistan, Alexandria in Egypt (according to legend), and Alexandria Eschate (“The Furthest”) in modern Tajikistan. The campaign took Alexander through Media, Parthia, Aria (West Afghanistan), Drangiana, Arachosia (South and Central Afghanistan), Bactria (North and Central Afghanistan), and Scythia. Alexander’s campaign resulted in some of the first attempts at a Utopian society (his Alexandrias; notably the Egyptian one with the “Library of Alexandria” in which public schools were constructed to fit the city’s liberal and philosophy focused culture) and helped to spread the knowledge of Greek philosophy across the globe. The line of thinking spread by Alexander had far-reaching influence. From Rome, to the Golden Age of Islam, to the Italian Republics, to the Enlightenment, and now to you. Not only was the style of thinking passed down across the globe and throughout generations, other aspects of culture were to. For example, you almost certainly live in a Republic at least partly based on Plato’s Republic (and you likely also have live in a place where culture was transferred by colonization… that being the other part of the story). #ThanksEnlightenedImperialism. I.e. You aren’t all good, but you play an important role in spreading the best parts of history throughout the globe (like the cannon of the old philosophies of Plato and Aristotle). Alexander the Great and the Situation … the Great? Crash Course World History #8. TIP: The main theme of Plato’s Socrates is the idea that sophists (those who think they know and charge money) are “less than” philosophers (those who know they don’t know, but love wisdom). Plato is more an idealist, and Aristotle more a realist. Aristotle notably took a well-paid tutoring job when he left Athens to tutor Alexander the Great. Bettany Hughes – The Ancient Worlds 1 of 7 Alexandria The Greatest City. Was Alexander trying to get as far away from Greece as possible to construct global polities? I’ve heard it been suggested. TIP: Another interesting teacher-student relationship is George Buchanan and James VI. Both were philosophers, George Buchanan an early political realist of Scotland predated in the west only by select figures like Machiavelli and James VI a sort of philosopher-king (in the same way Alexander was, which was King first, philosopher second). Jeffrey Brenzel: The Essential Value of a Classic Education. Why do we care about philosophy, why would Alexander care? Simple, super, super useful stuff. Not everything important is directly tangible. See The Spheres of Human Understanding. The student teacher relationship between the famous Greek thinkers and King is interesting. They all had great success and are generally historically admired, one has to assume this had a lot to do with the very useful nature of philosophy (which at the time meant both science and philosophy and other cerebral arts like rhetoric). 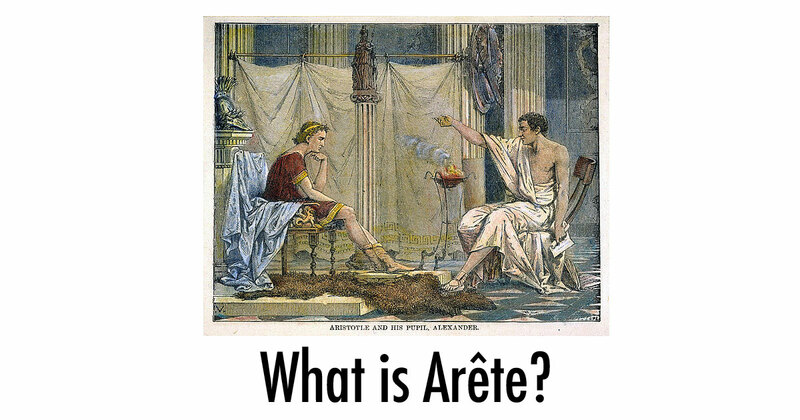 you did not explain what is arete = αρετή = virtue. We explain in the link: http://factmyth.com/arete-explained/ (I’ll make it more clear on the page). That said, I don’t see where I mentioned Arete on this page? Ah, in the image. Yes, I’ll include an explanation with a link to the above page. On his political ambitions in order to continue Socrates teachings and Plato’s Academy most due to the way Socrates was tried and executed and did not waver from his beliefs even in the face of death.